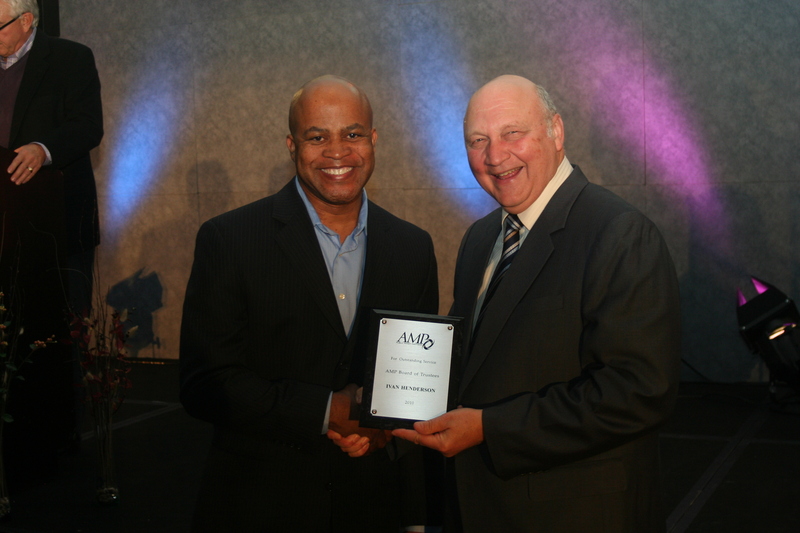 Cleveland Public Power Commissioner Ivan Henderson (left) receives award from AMP Board of Trustees Chair Jon Bisher at the 2010 OPPEI/AMP/OMEA Annual Conference. Cleveland – Cleveland Public Power was honored for its achievements during the past year at the 2010 OPPEI/AMP/OMEA Annual Conference. CPP Commissioner Ivan Henderson was recognized for completing a three-year term on the American Municipal Power, Inc. (AMP) Board of Trustees and the city was re-elected to a new term on the Board representing the Northern AMP Service Group. Cleveland Public Power was the recipient of the Financing of the Year Award from AMP for a $23 million bond refinancing effort that is allowing the utility to realize an approximate $2.5 million annual savings. The annual conference was held in Columbus October 25-28 and was attended by nearly 460 municipal officials and industry representatives, with speakers from various national organizations.